Nissan has introduced 22 new features with the 2017 Nissan Terrano facelift, and some much-needed features include – the new 7-inch touchscreen infotainment system with navigation and voice recognition. Other features comprise of – electrically operable ORVMs, hill climb assist and cruise control. The interior too has been spruced up with a nice black and brown dual-tone colour scheme along with new fabrics or leather upholstery, depending on the variant. The steering wheel has been redesigned and now gets controls for telephony and audio. Thankfully, Nissan has also provided an armrest for the driver in the 2017 Nissan Terrano. The buttons for power windows are now illuminated and the wing mirrors now get integrated indicators. The additional features include rear AC vents, rear parking sensors and leather wraps for steering and the gear-knob. The premium version gets leather seats and wood finish inserts on the doors. The base XE diesel variant gets all black interiors, while the rest of the line-up gets a beige-black combination that makes the cabin look more spacious. On the other hand, only one variant of the Terrano Petrol is on offer – the Terrano XL which has ABS-EBD-Brake Assist, driver side airbag, music system and front fog lamps. The top-end version of the Terrano gets 10-spoke machine-finished petal shaped alloy-wheels which, though luxurious, look odd on the aggressive looking SUV. They are better suited to the Renault Duster which is softer of the two SUVs churned out by the Franco-Japanese consortium, Renault-Nissan. The interiors of the two SUVs look similar but there are some important features differentiating the them. The quality of interiors is superior in the Terrano and the cabin is more plush. The music system is also different and this one is more ergonomic and user friendly. The OVRM adjustment is positioned under the handbrake lever and is unintelligible. The rest of the equipment list is pretty much the same including the one-step driver height adjust and orange backlight for the instrument cluster. It also gets a rear AC vent that adds to the comfort of passengers, but it is a tad bit noisy increasing the NVH level. The interiors of the Nissan Terrano are opulent with plush seats, abundant leg room along with ample head and shoulder space for all thepassengers. This roomy SUV can house five passengers and provide a luxuriant driving experience. The comfortable seats also have lumbar support, which makes the ride extremely pleasurable. The front and rear knee room are also adequate along with ample elbow room for all the passengers. The quality of interiors is where Terrano races far ahead of Renault Duster. The ambiance oozes opulence and gives a very premium driving experience. The seats are covered with premium leather upholstery for the top-end variants, while the other variants get high-quality fabric upholstery. The centre fascia of top and mid variants is defined with glossy black colour over it, and the remaining variants get a matt black finish. The dashboard comprises of air conditioner vents along with a large and brilliant instrument cluster. The dual-tone black-&-beige colour scheme takes the posh feel another notch up. Other elements include a leather- wrapped steering wheel, a chrome insert on gear shift knob and front and rear armrests. The door trims have a beige finish and the decorative strip added looks perfect on them. The new Nissan Terrano also has quite a few in-cabin storage spaces such as map pockets, seat back pockets, cup-&-bottle holders in the door as well as between the front seats, a rear centre arm rest with storage and holders also adds to the comfort level offered by this SUV. For the rear passengers, Terrano has a separate two-speed air conditioner with independent control. This SUV has parking sensors to simplify parking in congested areas. Terrano is also equipped with reading lamps to cater to the special needs of the passengers. Entertainment features like Bluetooth connectivity, an integrated 2-Din Audio system with CD, MP3, AM, FM, USB Aux-In, Bluetooth four speakers – 2 front & 2 rear take pleasure another notch up. That apart, Terrano comes with a full size spare wheel, which has been further covered with a similar tubeless radial tyre and placed inside the boot compartment along with other tools required to change the tyre. The Nissan Terrano comes with a six speed manual transmission for the diesel engine that has 109 hp of power while the petrol engine and the lower state of tune diesel engine is offered with a 5 speed gearbox. 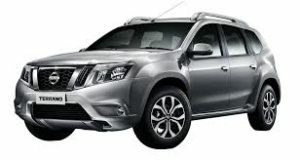 The Nissan Terrano diesel is also available in an AMT.In terms of safety, the Nissan Terrano is offered with Anti lock Braking System (ABS) with Electronic Brakeforce Distribution (EBD), dual front airbags, speed sensing automatic door locks and hazard warning switch.The Nissan Terrano has an ARAI claimed fuel efficiency of 13.2 kmpl for the petrol variants and 19 kmpl for diesel variant which is acceptable for its segment. We loved the Duster for its braking performance and the Terrano with the same Disc/drum setup performs very well. The car came to a halt from 100kmph in a short 40.24m which is just a little shorter than the Duster. The Terrano shows the same confidence shedding speeds in a straight line without any squirming at the steering wheel and with good control from the ABS. The Nissan Terrano received its first major updates since its introduction back in 2013. Being the only SUV offering in the Indian market, the Terrano inevitably attracted lot of attention for those who does not prefer the Duster. 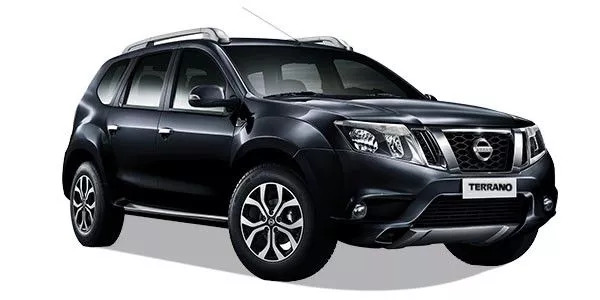 Off course there is no questioning the fact that this SUV looks far better than Duster but that also does not hide away the fact that both the SUV’s are not so different than each other.